This post is my attempt to put down some thoughts that I can revisit at some point later in my journey to decipher where I belong and in the process who I am. I have always thought who I am at any time is most often correlated with where I think I belong. May be that is the problem 🙂 Given that my sense of belonging is of course dependent on the status within the social practices of what I consider my community. Does that make being and belonging ever changing for me? Yes! Change is good? Not sure. In my professional life change is what I strive to bring about and the hope is that it is for the better for all concerned. In personal life this constant need to belong is something I have found very tiring and sometimes futile – partly because my belonging, I have found, is co-dependent on other people accepting my understanding of belonging to/with them, which makes it futile if only I want to belong and they don’t see me belonging there. 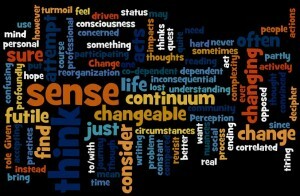 Perception does make me think that changing is not always good. Though the urge to belong is never ending. In my quest to belong I am actively participating. This to my mind is my sense of being. It may be to some the same as what I do makes me who I am, but am not convinced that it explains the complexity of being as opposed to just doing to belong. I find it hard to use the two (doing and being) instead of each other but find the nuances of being lost when I just consider doing. My actions are changeable but that does not mean the act of being is as changeable as the acts themselves. 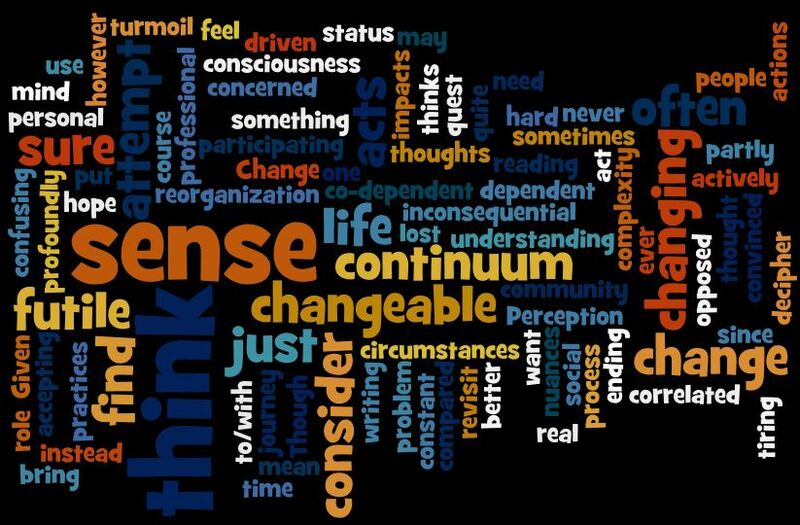 My acts I feel are driven more by consciousness and/or circumstances rather than any real change in my being. (I am quite sure by this point I am confusing anyone reading this, but since this is an attempt at writing down the turmoil of being and belonging for me, its OK). So often however what one thinks of belonging is rather inconsequential when compared to what those who I think I belong with think of my belonging there. This impacts rather profoundly the sense of being and a reorganization of my sense of being. If being is a continuum what is the role of belonging in this continuum?